These are lists of mountains and mountain ranges in Ireland. Those within Northern Ireland, or on the border, are marked with an asterisk, while the rest are within the Republic of Ireland. Where mountains are ranked by height, the definition of the "topographical prominence" (or "relative height", or "drop", or "re–ascent"), used to classify the mountain (e.g. the change in elevation required between neighbouring mountains), is noted. [a] In British definitions, a height of 600 metres (1,969 ft) is required for a "mountain", whereas in Ireland, a lower threshold of 500 metres (1,640 ft) is sometimes advocated. The lowest minimum prominence threshold of any definition of an Irish mountain is 15 metres (49 ft) (e.g. the Vandeleur-Lynam), however most definitions, including the UIAA criteria, do not consider prominences below 30 metres (98 ft) as being mountains (e.g. must at least be an Arderin or a Hewitt). Many British definitions consider a peak with a prominence below 150 metres (492 ft), as being a "top", and not a mountain (e.g. must be a Marilyn). A popular definition of an Irish mountain requires a minimum prominence of 100 metres (328 ft) (e.g. a HuMP), and is the basis for the 100 Highest Irish Mountains. While Irish mountains are ranked according to Irish classifications, they are also ranked on classifications that cover Britain and Ireland (e.g. Simms and P600s). Mweelrea from Doo Lough in Connemara. Mweelrea is the highest Provincial Top in Connacht, the highest County Top in Mayo, the 5th highest Irish P600 mountain, the 14th highest Irish Marilyn mountain, the 16th highest Irish MountainViews mountain, the 26th highest Irish Arderin/Hewitt mountain, and the 34th highest Irish Vandeleur-Lynam/Nuttall mountain. It is not a Furth (or Irish Munro), and therefore not a Real Munro. There is no consensus on the definition of "mountain", but in Britain and Ireland it is often taken to be a summit over 2,000 ft, or more latterly, 600 m. There is less consensus about the topographical prominence requirement (e.g. the change in elevation required between neighbouring mountains), which can vary between 30–150 m (98–492 ft). Prominence is even strongly debated regarding UIAA classification of Himalayan mountains. In the alps, the UIAA requires a prominence of over 30 m to be a "peak" and over 300 m to be a "mountain". The lowest threshold of prominence in Britain and Ireland is 15 metres (49 ft). The only definition in which prominence is not used, is where topographic isolation is used (e.g. the use of "sufficient separation" for Munros). Most Britain and Ireland definitions no longer categorise prominences below 30 metres (98 ft) (e.g. no new Nuttalls and Vandeleur-Lynams), and peaks with a prominence between 30–150 metres (98–492 ft) are now defined as tops rather than mountains (e.g. the 227 Munro Tops). In Ireland, a prominence threshold of 100 metres (328 ft) is proposed for a mountain. The term Dillon is used to describe any of the 212 Irish summits in Paddy Dillon's well–regarded Irish 2010 climbing guidebook: "The Mountains of Ireland". All of Dillon's summits are over 2,000 ft (610 m), and almost all have a prominence above 30 m (98 ft) (i.e. they are very similar to the list of 209 Irish Hewitts). The term Myrddyn Deweys are peaks in Ireland, between 500 metres to 2,000 feet (609.6 metres) in height, with a prominence above 30 metres (98 feet), which was published by Michael Dewey and Myrddyn Phillips in 2000. Myrddyn Deweys are the Irish equivalent of Deweys, which extend the Hewitt classification down to 500 metres. There are 200 Myrddyn Deweys. MountainViews was created in 2002 by Simon Stewart as a non–profit online database for climbers in Ireland to document and catalogue their Irish climbs. Its main data source are from the Ordnance Survey Ireland ("OSI") maps, however, it conducts its own surveys, which the OSI has integrated into its own database, and it also integrates other important Irish mountain databases such as the Paul Tempan Loganim Irish Placenames Database. Collins Press published the MountainView Online Datase in 2013 in the book: A Guide to Ireland's Mountain Summits: The Vandeleur-Lynams & the Arderins. Since 2012, MountainViews has been partnered with the Database of British and Irish Hills ("DoBIH"), which is the main live database for the categorisation of mountains and hills in Britain and Ireland. However, MountainViews can differ slightly from DoBIH on the measurements for certain Irish mountains. [k] MountainViews is available as a downloadable database, or online, under the title, MountainViews.ie. This is the MountainViews[i] 100 Highest Irish Mountains list, which was published by Collins Press in the 2013 book: A Guide to Ireland's Mountain Summits: The Vandeleur-Lynams & the Arderins. It combines Paul Tempan's 2012 research into Irish mountains and Irish mountain names. The list requires a prominence of over 100 m (328 ft), a compromise between the popular British Isles Marilyn criteria of 150 metres (see List of Marilyns in the British Isles for a ranking of Irish Marilyns by height and by prominence), and the Simms–Hewitt–Arderins criteria of 30 metres (see List of mountains of the British Isles by height for a ranking of Irish Simms by height and by prominence). It is a widely used list, and it contains 25 of the 26 Irish P600s (Slieve Snaght, a P600, did not make the 100 Highest). Real Munro: Height over 3,000 feet (914 m), prominence over 150 metres (492 ft). P600: Any height, prominence over 600 metres (1,969 ft). A noted definition of an Irish mountain over the lower height threshold of 500 m (1,640 ft), is the Arderins list, but which meets the minimum requirement for a "mountain" with a prominence above 30 m (98 ft), and is an Irish equivalent of the Hewitt (the 207 Arderins over 2,000 ft (610 m) are the 207–209 Irish Hewitts[k]), or the Simm (the 222 Arderins over 600 m (1,969 ft) are the 222–224 Irish Simms[k]). The 200 Arderins below 2,000 ft (610 m) are the Myrddyn Deweys (e.g. the total of the 207 Irish Hewitts and the 200 Myrddyn Deweys equal the 407 Irish Arderins). MountainView's Online Database[i] of Arderins was published by Collins Press in the 2013 book: A Guide to Ireland's Mountain Summits: The Vandeleur-Lynams & the Arderins, and updated in 2015. In 2018, the MountainView Online Database listed 407 Irish mountains as meeting the Arderin definition. As of October 2018[update], nobody is officially recorded as climbing all the Irish Arderins. On 3 October 2018, English Lake District climber, James Forrest, completed all 273 Irish Vandeleur-Lynams in 8 weeks. MountainViews and Database of British and Irish Hills recognise a list of 337 summits as Carns, having height above 100 m (328 ft) and below 400 m (1,312 ft). MountainViews and Database of British and Irish Hills recognise a list of 484 summits as Binnions, having prominence at least 100 m (328 ft) and height below 400 m (1,312 ft). There are 4 Irish Provincial Tops, namely: Carrauntoohil, in Munster, Lugnaquilla in Wicklow, Slieve Donard, in Ulster, and Mweelrea in Connacht. In addition, there are 27 Irish County Tops, as 10 counties share the same county top, namely: Galtymore for Limerick/Tipperary, Mount Leinster for Carlow/Wexford, Sawel for Londonderry/Tyrone, Cuilcagh for Cavan/Fermanagh, Arderin for Laois/Offaly. Whereas the MountainViews, Vandeleur-Lynam, and Arderin classifications are unique to Ireland, Irish mountains appear in other similar classifications that have been used in across Britain and Ireland. ^ Some definitions use "feet" as their principal metric (e.g. Munros), others use "metres" (e.g. P600s, and Vandeleur-Lynams, and Arderins), and some use a mix of both (e.g. Hewitts and Real Munros). ^ While there is no explicit prominence requirement, the Scottish Mountaineering Club ("SMC") reviews aspects like prominence, and isolation, when deciding on the official list of Munros. All of the SMC list of 34 Furths have a prominence over 30 m (98 ft), except for Caher West Top, which is 24 m (79 ft). ^ P600 an international classification of major peaks (along with the P1500, or Ultra-prominent peak), which was first applied by Alan Dawson (who called them "Majors"), and has become popular in the British Islands. ^ The definition of an Irish Vandeleur-Lynam is similar to a "Nuttall" in England and Wales, except that the Vandeleur-Lynam is fully metric. ^ a b A Vandeleur-Lynam is a hill in Ireland at least 600 metres high with a drop of at least 15 metres on all sides. In 1952 Joss Lynam produced a list of 2000ft summits with 50ft drop with assistance from Rev CRP Vandeleur. Joss Lynam updated a version of this list and published it in a reprint of "Mountaineering in Ireland" by Claude Wall printed in 1976. The metricised equivalent was published in 1997. Lynam was actively involved with the list until 2002, thereafter assisting MountainViews with subsequent revisions until his death in 2011. ^ a b The Arderin an Irish–equivalent of a "Hewitt", having the same metric prominence requirement of 30 m (98 ft), but the Arderin height requirement is lower, and metric, at 500 m (1,640 ft). ^ An Arderin is a hill in Ireland of 500m or over with a drop of at least 30m on all sides. This list was drawn up in 2002 by the MountainViews publisher [Simon Stewart] from an early listing of the Myrddyn Deweys with those hills from the Vandeleur-Lynams which meet the higher drop criterion. The actual list name, created in 2009, comes from the 527 m hill, Arderin, which is the County Top for both Laois and Offaly and means, from the Irish, "Height of Ireland". ^ MountainView's classification is a popular modern standard for categorising mountains in the UK. ^ a b c d e f g MountainViews was created in 2002 by Simon Stewart as a non–profit online database for climbers in Ireland to document and catalogue their Irish climbs. Its main data feed is taken from the Ordnance Survey Ireland ("OSI"), however, it also integrates other established Irish mountain databases such as the Paul Tempan Loganim Irish Placenames Database. Collins Press published its Online Datase in 2013 in the book: A Guide to Ireland's Mountain Summits: The Vandeleur-Lynams & the Arderins. MountainViews is also partnered with the important Database of British and Irish Hills ("DoBIH"), which is the main live database for the categorisation of mountains and hills in the British Isles. ^ MountainViews defines Irish peaks that meet this criterion as being "Irish mountains". ^ a b c d As of October 2018[update], the Irish MountainViews Online Database, list the prominence of Knockbrinnea (W) as 29m, and Carrignabinnia as 27 m, and thus they do not qualify as Irish Arderins, which means that MountainViews does not classify these two peaks as Hewitts or Simms; the total number of Irish Arderins over 2,000 ft is thus 207. The DoBIH however uses the Harvey Tables which list the prominence for both at 30 m, and thus the DoBIH class them as Irish Hewitts and Simms, giving 209 Irish Hewitts and 224 Irish Simms on the DoBIH tables. ^ In all cases this is the "Name Origin and Meaning" column from Paul Tempan's Irish Hill and Mountain Names (2010). ^ The ratings are from the Mountainview Online Database of Irish climbs as at October 2018, as voted by members. ^ Nuttall, John & Anne (2008). The Mountains of England & Wales – Volume 2: England (3rd ed.). Milnthorpe, Cumbria: Cicerone. ISBN 1-85284-037-4. ^ a b A Mountain is a Mountain – isn't it? at www.go4awalk.com. Accessed on 3 Feb 2013. ^ mountain at dictionary.reference.com. Accessed on 3 Feb 2013. ^ "Nepal mountain peak expansion bid stalls". BBC News. 18 October 2013. ^ "A funny name for a mountain". Mark Horrell. 4 June 2014. I explained how these five ridge tops couldn’t possibly be classified as 8000m peaks in their own right because each of them requires less than 135 metres of re-ascent between their respective parent peaks, Kangchenjunga and Lhotse (known as topographic prominence). It seems that where logic and common sense fail the NMA feels that flattery may work instead. ^ "MOUNTAIN CLASSIFICATION". UIAA. March 1994. Topographic criterium: for each summit, the level difference between it and the highest adjacent pass or notch should be at least 30 m (calculated as average of the summits at the limit of acceptability). ^ a b c d e "Irish Highest 100: The highest 100 Irish mountains with a prominence of +100m". Mountainviews.ie. September 2018. ^ Mountains – Key Facts. The Munros, Corbetts, Grahams, Donalds & Furths Archived 2012-09-04 at WebCite at www.smc.org.uk. Accessed on 9 Feb 2013. ^ "Magnificent munros: 17 Scottish mountains to bag in your lifetime". The Telegraph. 13 April 2017. Of the 282, 200 are said to have a summit prominence of over 150 metres and are therefore known as "real monros", but that's for another day. ^ "The P600 peaks". HillBagging.co.uk. ^ Alan Dawson; Rob Woodall; Jonathan de Ferranti (2006). "THE BRITISH ISLES COMBINED LIST FOR THE UNITED KINGDOM AND REPUBLIC OF IRELAND". Previously available lists used a cutoff of 2,000 feet (609.6 meters). The 2000 foot cutoff would result in a total of 111 mountains: 90 for Great Britain, 1 for the Isle of Man, and 20 for Ireland. By lowering the cutoff to 600 meters (in order to be consistent with upcoming lists for Europe), we now reach a total of 119 mountains, including 93 for Great Britain, 1 on Man, and 25 in Ireland. ^ a b "Vandeleur-Lynams: Irish mountains of 600+m with a prominence of 15m". MountainViews.ie. October 2018. ^ a b "Arderins: Irish mountains of 500+m with a prominence of 30m". MountainViews.ie. October 2018. ^ Jim Bloomer; Roddy Urquhart (2018). "Principles of Peak Classification". ProminentPeaks.org.uk. The UK and Ireland are a family of islands, so the issue of plateau areas does not arise. The authors have concluded that good criteria for the UK are a minimum height of 500 metres and prominence of 100 metres. This is the basis for the UK Prominent Peaks database. ^ "MountainViews.ie, a hillwalking resource for Ireland". Mountaineering Ireland (Irish Mountaineering Council). 2014. ^ Simon Stewart (2018). "MountainViews Sources and Credits". MountainViews.ie. ^ a b "Credits and Acknowledgements: Lists of the summits, islands and coastal features for Ireland". Mountainview.ie. 2018. The "Hundred Highest" list includes summits with a prominence at a minimum of 100 m, and has been introduced to give a height based list, not too long, with a spread of locations for Ireland. ^ "Background to the lists". Database of British and Irish Hills. 2 August 2018. Dillons: Hills in Ireland at least 2,000 feet high published in The Mountains of Ireland. There is no prominence criterion. 15 Dillons are not Hewitts; 14 have drop <30m, while 20213 Corcog has a 609m spot height (the old 1:10560 map shows 2012ft which converts to 610.6m on the new datum). 12 Hewitts are not Dillons. ^ a b "Myrddyn Deweys". HillBaggingUK. The Myrddyn Deweys are hills in Ireland with a height between 500-609m and a prominence of 30m. The list was researched by Michael Dewey and Myrddyn Phillips and was made freely available to the Mountaineering Council of Ireland in 2000. In 2011 the data was re-examined against the latest mapping. [...] There are 200 Myrddyn Deweys. ^ "Welcome". The Database of British and Irish Hills. Retrieved 10 October 2018. ^ "Birthday celebrations with two new Nuttalls". Ordnance Survey. 23 November 2016. DoBIH was founded by Graham Jackson and Chris Crocker as a personal tool to help them log their own hill ascents. However, over the years DoBIH evolved into something much bigger with six editors and many hillwalkers supplying data. ^ "The Database of British and Irish Hills - past, present and future". The Relative Hills of Britain (rhb.org.uk). May 2016. ^ "Corrán Tuathail/Carrauntoohil". MountainViews.ie. Archived from the original on 20 December 2017. Retrieved 2 January 2018. ^ "Binn Chaorach/Beenkeragh". MountainViews.ie. Archived from the original on 3 January 2018. Retrieved 2 January 2018. ^ "Cathair/Caher". MountainViews.ie. Archived from the original on 3 January 2018. Retrieved 2 January 2018. ^ "Cnoc na Péiste/Knocknapeasta". MountainViews.ie. Archived from the original on 3 January 2018. Retrieved 2 January 2018. ^ "Cathair Thiar/Caher West". MountainViews.ie. Archived from the original on 3 January 2018. Retrieved 2 January 2018. ^ "Maolán Buí". MountainViews.ie. Archived from the original on 3 January 2018. Retrieved 2 January 2018. ^ "Cnoc an Chuillinn". MountainViews.ie. Archived from the original on 3 January 2018. Retrieved 2 January 2018. ^ "The Bones". MountainViews.ie. Archived from the original on 3 January 2018. Retrieved 2 January 2018. ^ "An Gunna Mhór/The Big Gun". MountainViews.ie. Archived from the original on 3 January 2018. Retrieved 2 January 2018. ^ "Cruach Mhór". MountainViews.ie. Archived from the original on 3 January 2018. Retrieved 2 January 2018. ^ a b c Paul Tempan (February 2012). "Irish Hill and Mountain Names" (PDF). MountainViews.ie. ^ "10 of the Highest Mountains to Climb in Ireland". Outsider.ie. 2018. We’ve compiled a list of the 10 highest mountains in Ireland for you to get your teeth into. ^ Geraldine Gittens (11 October 2018). "Man 35 survives storm and climbs 273 Irish mountains". Irish Independent. And that brings us to today, when Independent.ie talks to the 35-year-old. He’s just completed the Vandeleur-Lynam – the name given to the group of 273 Irish mountains over 600 metres. [...] Forrest began his adventure on Thursday, August 9, and reached his final summit – Knocknadobar in county Kerry – on Wednesday, October 3. ^ "Carns". MountainViews. Retrieved 16 October 2018. ^ a b "Background to the lists". Database of British and Irish Hills. Retrieved 16 October 2018. ^ "Binnions". MountainViews. Retrieved 16 October 2018. 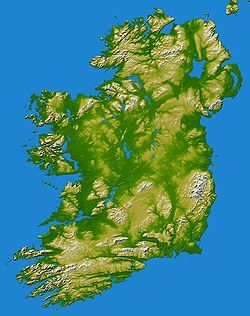 Wikimedia Commons has media related to Mountains of Ireland.